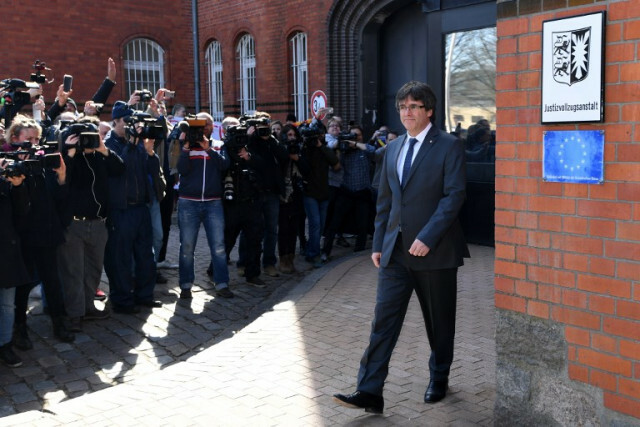 Spanish prosecutors have handed over new information to Germany they hope will back their demand to extradite former Catalan leader Carles Puigdemont on rebellion charges, the justice minister said Friday. Rafael Catala told Spanish radio both sides had met Thursday at the headquarters of Eurojust, the European Union’s judicial agency in The Hague, just one week after a court in Schleswig-Holstein rejected extraditing Puigdemont on the controversial charge. It ruled that rebellion — which carries up to 30 years in jail — was not punishable under German law, and that the closest equivalent, high treason, did not apply because Puigdemont’s actions were not accompanied by violence. Catala said that with thenew data, the German prosecutor would now be able to “provide further information to substantiate” the use of violence which would justify the rebellion charge. According to Spanish daily El Pais, the new information includes videos of alleged violent acts and police reports. Puigdemont was detained in Germany late last month after Spain issued a European arrest warrant against him for his role in Catalonia’s failed bid to break from Spain last October. He had been in self-exile in Belgium since then but was travelling through Germany when he was detained. On April 6th, the Schleswig-Holstein court released him on bail and rejected extraditing him for rebellion. It has yet to rule on another, lesser charge of misuse of public funds. Even if Puigdemont is eventually extradited, the rejection of the rebellion charge is a major blow for Madrid as it means he cannot be tried in Spain on that count. It could also potentially derail Spain’s case against nine other Catalan separatists also accused of rebellion who are in preventative custody in Spain. These nine could argue that the man who led Catalonia to the verge of secession cannot be prosecuted on lesser charges than them.